Traditional insulated sandwich panels, comprised of a thin fascia wythe, insulation and a much thicker structural wythe would typically fall into this system. 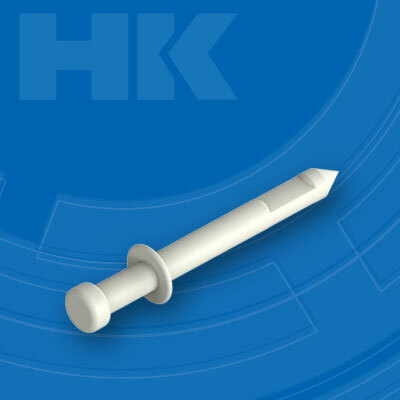 This system is comprised of our HK Standard non-conductive wall tie and any type of desired rigid insulation. This system is designed to create a non-composite insulated concrete sandwich panel. This allows the two wythes of concrete to be tied together with a non-conductive wall tie but still allow the two layers to shrink or expand independently of one another using the tie for deflection. * All Standard Ties can be made in 0.25 inch increments depending on project design and specifications. The HK Standard ties are tested in accordance with the ICC-ES AC 320. The table below displays the testing comparisons of some of our popular Standard ties. You can view more complete testing reviews for each tie on their individual product pages.